You know that a foodstuff’s star has waned when trolls turn up their noses at it. In The Hobbit, one of the menacing band that Bilbo Baggins encounters on the road to Rivendell is to be overheard complaining bitterly about his supper. ‘Mutton yesterday, mutton today, and blimey, if it don’t look like mutton again tomorrer,’ he grumbles. The troll was very much a product of Tolkein’s time. The Hobbit came out in 1937, when the tide of gastronomic taste was already beginning to turn against mutton-defined as meat from sheep that are more than two years old. When the Second World War broke out, the drive to feed the populace as cheaply as possible meant that mutton, which by its very nature is a labour-intensive source of protein, was sidelined. Later, tasteless frozen imports that gave it a bad name swamped the market, and fine-grained, flavoursome cuts were done a terrible disservice by being boiled for hours on end. By the 1960s, this former national treasure (Mrs Beeton doubted ‘whether any other joint is better liked’) had a serious PR problem. The situation might never have changed had it not been for The Prince of Wales, whose Mutton Renaissance campaign (www.muttonrenaissance.org.uk) transformed the meat’s fortunes-and those of British sheep farmers. 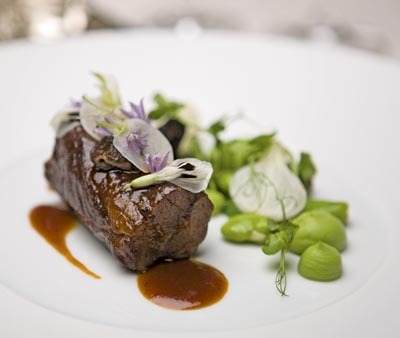 Today, mutton is proudly served in many of the smartest London hotels, including The Ritz. ‘This initiative would have gone nowhere without His Royal Highness,’ emphasises its executive chef John Williams, who took over nine years ago after heading up the kitchens at Claridge’s and The Berkeley. ‘It was his idea-he has a real passion for mutton, and it’s frequently served at Highgrove. He contacted the Academy of Culinary Arts and said “I need your help-we’ve got to get it back on the menu”.’ A framed photograph of the pair at the campaign’s 2004 launch, which took place at The Ritz, hangs proudly in Chef Williams’s office. The Prince of Wales, who had happy childhood memories of mutton dishes, felt it was ‘a tragedy that [the meat] had disappeared from the culinary experience of most people’, and was determined to do everything he could to support sheep farmers that operated in a traditional way. Almost a decade on from the launch of the Mutton Renais-sance, things are going from strength to strength. Producers such as Cumbria’s Heritage Meats (www.heritagemeats.co.uk) and The Blackface Meat Company (www.blackface.co.uk) are widely celebrated for their mutton, and chefs including Hugh Fearnley-Whittingstall and Jamie Oliver have rallied round. For the garnish, wash and peel all vegetables, then glaze in a mixture of water, butter, sugar and salt. They will be added to the stew at a later stage once tender. Heat the oil and butter in a sauté pan and place the seasoned mutton pieces in the pan. Seal the meat briskly until it’s very caramelised and season with salt, pepper and sugar. The sugar settles on the bottom of the pan, where it turns to caramel. It’s dissolved by moistening and ultimately will give the required colour and taste to the sauce. Take the meat from the pan, then remove some of the fat. Add the root vegetables and sweat for a few minutes, then add the tomato purée. Add the flour and cook out briefly. Add the stock a little at a time, mixing thoroughly to prevent lumps then add the tomato concasse. Bring to the boil and skim, then braise in the oven for approximately 2½ hours at 130˚C/ 250˚F/gas mark 1. To make your pea purée, bring a pan of boiling salted water to the boil, add the peas and cook until soft. Remove from the water and add to a food processor, add butter and blitz until smooth. Once the mutton is removed from the oven, decant the meat pieces and pass the braising liquor through a fine sieve onto them. Finally, take the glazed vegetables and potatoes and add to the stew. Season to taste with chopped parsley and serve with pea purée.